Canada can get cold. The Canadian Rockies can get even colder. I like to sleep comfortably and warm, but I’m lazy and I don’t like to carry a lot of weight. My current system of a tarp and quilt is what I consider a great compromise between weight and warmth. 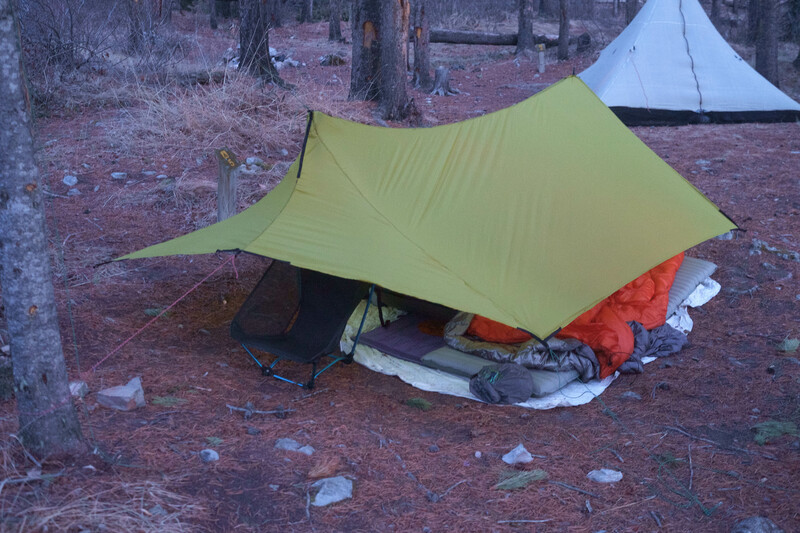 When I started out, I used a commercial down sleeping bag, and a backpacking tent. These can be great, and modern tents have come a long way in the last decade. 10 years ago, 5 pounds was considered light for a 2-person tent. Now, I have a commercial 4-person tent that weighs 3 pounds with a pole and mosquito net insert. Weight is no longer really the savings when making your own gear. Most of my backcountry trips seem to involve rain or snow (except if I bring my friend Jeremy, who also does not mind adverse weather). A few years back, I did some experimentation to see what would happen to my sleeping bag after a few days of sleeping out. I was surprised to find that my sleeping bag took on several hundred grams of moisture the first night of sleeping in a tent. Even with draping my bag out in the sun to dry, by the third night I was sleeping in a less effective, and heavier system. There are about 7 million tarp designs available on the internet, and I took ideas from a few of them. I wanted it to shed wind and water better than a rectangular tarp, so I made it with a catenary cut ridge line and front. I also wanted not to adjust in the middle of the night, so I chose silpoly as the material for minimal stretching. I also wanted light weight but enough durability to hold up in a substantial wind. The holy grail of bikepacking tarps is one where your bike fits inside, or can be used to support the tarp. I also hike and ski, so though I think bike-supported are extremely cool, I opted to use bike supports only for treeless bikepacking situations and use hiking/ski poles as primary supports where trees are not available. The tarp weighs in at 300g, so it ended up being on the lighter end of the shelter scale. The silpoly does not stretch in the rain and doesn’t need to be re-tensioned when it rains. I do not recommend it as an easy fabric to sew, it is like sewing live squirrels to each other. Since I’m foolish enough to think that winter is the primary bikepacking season, I wanted to have some versatility to my sleeping bag system. I wanted lighter weight in summer, I wanted synthetic material for the outer since down performs so poorly in wet conditions. I wanted light weight since my daughter would be carrying one. In the 80s, I used a dual bag system of a sleeping bag with an overbag. I really liked it, but I had also been interested in quilts as an alternative to sleeping bags. I talked up the concept of a down bag with a synthetic quilt over it for cold, with the quilt on its own for more moderate temperatures (well, moderate for the Canadian rockies). Camping quilts are not exactly like a bed quilt, they are usually shaped in some way, and many (like mine) have a footbox like a mummy bag and a drawstring closure at the top. 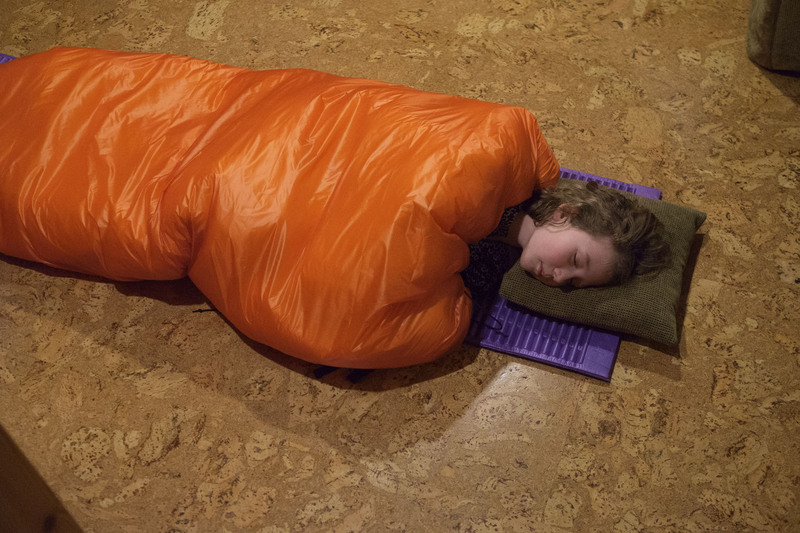 The home made portion of the combo ended up as the quilt – down sleeping bags are relatively available, and affordable. I used Climashield Apex as my insulation layer and the lightest nylon I could find, Membrane from RSBTR. The sleeping quilts have simple ribbon loops to attach them to a sleeping mat, so they can tuck under the sleeper at the sides, and they work well down to about -10ºC. The quilts being about 800g each puts them as competitive weight wise with the commercial versions, but they were about half the price to make as the commercial equivalent. In winter, adding a -10ºC sleeping bag yields a combination that is comfortable below -30ºC, theoretically to -40ºC, but we have not been out that cold since I made them. A big problem for me with traditional mummy bags has been that the hood can end up in the wrong spot when i roll over, and then the hood fabric gets wet from breath condensation. With the quilt, this doesn’t happen since the quilt lacks a hood. To deal with the lack of hood, I made sleeping hats from the same material as the quilts themselves. 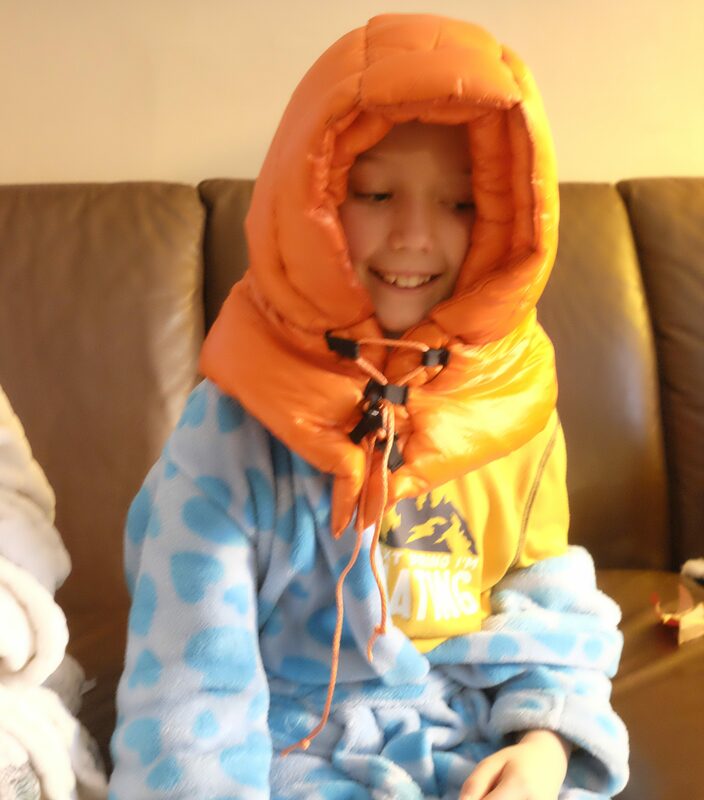 the hat acts like a hood, but turns with the sleeper allowing them to not get wet from breath. Fiona and I had enjoyed the previous weekend’s trip to Shadow Lake, that Tania suggested we do a quick overnight to the campground at km 7.2, Lost Horse Creek. Tadhg and I decided to bike, both of us generally prefer biking when it’s one of the options. Tania left herself the option to ski or walk, and Fiona was planning to either ski or ski with her other pair of skis. At the trail head, Tania opted to take advantage of the packed trail surface and walk. With the weather above freezing, the way in had us down to our t-shirts in short order. Tadhg did leave his hat on. Fiona and I decided to sleep under the stars to save time putting up our tarp and in hopes of seeing some Northern Lights (though chances were slim, the northern sky had mountains obstructing the view). We dug out a nice spot in the snow to put the tent up for Tania and Tadhg. I was proud of getting up at 7:15 to make coffee (a pride that lasted until I found out it was time change weekend in the car home) Winter has the great advantage of being able to bring real milk for Tania’s cappuccinos, and I always feel better about serving real milk than even the whole milk powder that works reasonably well. We gave Fiona and Tania a substantial head start while we packed up, but even with that, the bikes speed advantage over Tania’s walking, and the downhill trail meant that we passed them on our way down. It was a fun finish to a very relaxing weekend. We have been going to Lake O’Hara for a couple of years on family day weekend, but this year we decided to switch thing up for a variety of reasons. We considered skiing in to Mt Assiniboine again, but the forecast did not look promising in terms of seeing the mountain after what for us is a 2.5 day ski in. Spray River from Banff to Goat Creek has been consistently good for us in that we’ve never seen people there that didn’t come with us, it is easy to bail from, it is pretty, and it super easy to ski or bike to. We decided on 2 nights at the campground with a day trip up Goat Creek. Tania chose skiing over biking, the kids followed her lead, and since I didn’t really want to bike alone, I skied as well. Tadhg and I towed sleds, he likes to avoid backpacks at all costs, I just had too much stuff to fit in my backpack. It was not warm, but with our routine of using a fire to roast our burritos, then going for a walk before bed rather than sitting around a fire getting sweaty and telling our bodies to shed heat, we were quite fine as we went to bed near 10 pm. Fiona and I were under the tarp as usual, and since the forecast called for cold, we had our -10ºC sleeping bags with our quilts over them and were toasty warm. When I looked at the thermometer at 8 in the morning, I was a little surprised to see it reading -23ºC (-10F). Fiona and I eventually got out of bed and made the trek down to the eating area to make coffee. In what would turn out to be a potentially serious event, when I screwed my stove together, I failed to notice some ice that prevented the canister from sealing correctly to the valve. As the stove sat there burning poorly, I went to get some more snow to melt. As I was returning with the snow, I got to see the fuel that had leaked out catch flame. While unspectacular, I was concerned that if I just left the flames burning, it would heat the canister enough to become a big problem. I cleverly figured what the problem was as I was walking toward the stove, and quickly reached in and tightened the canister to the valve. Once the leaky canister was dealt with, the remaining fire quickly dissipated. Now this would not have been very serious at all if not for the quantity of fuel that leaked out. In the absence of a scale to measure how much fuel was left in the canister, I have to rely on “the force” to estimate remaining fuel. The remaining fuel did not give me a comfortable feeling. I was certain that I would have enough for dinner, but not positive that Monday morning coffee was going to happen. I advised Tania when I handed her her first cappuccino that we might have a fuel shortage. Neither of us was keen on facing a morning without coffee. While there is a fire pit at the Spray 6 campsite, making a cooking fire at those temperatures seemed a little onerous to set ourselves up for. We decided to do our day trip and then head home afterward. The choice was hardest on Fiona who would have liked to stay another night. We did get in a wonderful ski on a beautiful clear day. Though cut a bit short, we still had a great weekend in the woods. When measured in fun, this was a great success. It also shows the importance of being willing to change plans in the event of unusual circumstances. We weren’t really in danger, but we also weren’t necessarily in line for the level of comfort that we wanted. I like to think that I learn lessons when things don’t go exactly according to plan. We did of course have the option of me skiing back to town to buy a spare fuel canister, but this was a family trip, and the trade of me missing the day’s skiing with them for a trip to town sounded like poor value. In hindsight, this was the correct decision. In the future, I can consider several options. The best option is to be more careful with fuel, to avoid leaks. I should also have been making more of an effort to get to the river to fetch water rather than melting snow. Also, on a trip like this, would it really kill me to bring an extra 200g of fuel? I only had about 75g of spare fuel and I estimate that I lost about 100g. I normally bring 2 fuel canisters with me on winter trips, in this case, I had used up the mostly empty canister on the first night. I had felt that since I had plenty of fuel, there was no need to be thrifty and I could just use up the canister. Next time, there will be no frivolous (fuelish?) wasting of even the dregs of the canister. I had also expected to be using fresh milk for cappuccinos, which saves fuel. I had not insulated the milk jug though (I usually do), so it froze solid on the first night. I will continue to hang my food bag at night, not just for bears, but for rodents, who will spoil a food bag very effectively overnight. It’s worth thinking about bringing my white gas stove as well. While it is a bit more complicated to use, it is much easier to tell exactly how much fuel is left in it. Had we been going to Mt Assiniboine, I would have been carrying both stoves (or possibly an alcohol beer-can stove), I like to have a backup because of the greater isolation of the trail. I would bring only a small fuel canister for the butane stove and consider it emergency backup. The white gas stove (I have an MSR Whisperlite) is also way more functional below -30ºC (I also have an arctic pump for mine) where the canister stove works, but is very slow. Our friend Lindsay suggested one day that we should do an overnight bikepacking trip with our families to celebrate the start of the new school year. I never pass up an opportunity to sleep outside, so I was definitely in. We each told a few friends about it, and before long what we had thought would be only be us and another couple of people turned into a full campground. I blame Lindsay for being so famous. Side note: Lindsay sent many of you here to read my capture of the energy and essence of the trip. I’ll try not to let her down [pulls out “Writing English for Dummies” book]. Our friends were diverse in experience, backgrounds and ages. We were all experienced cyclists, but some of us had not been bike camping before. A few of us had been on Megan Dunn’s bikepack.ca family bikepacking trip during the summer, a few of us were people we knew from social media and hadn’t met in real life. Though I myself like some of the more technical trails, I wanted this trip to be accessible for novices. That way they wouldn’t hate me for my trail selection. I also wanted it to be a not-to-distant drive from Calgary, and to provide enough challenge that the kids and parents could feel that they had accomplished something. Lindsay and Des were planning to bring their cargobikes, so I wanted to pick a trail that would be compatible with them as well. When Tadhg and I had toured the newly-built Romulus campground (it replaced the one that was washed away in the 2013 flood) we thought it was very nicely done, with the hiker section being just as nice as the equestrian side, and the food area being separate from the sleeping area. The trail in met our criteria, and so it was what we recommended. We met at the trailhead at 11:00 AM parent time (11:45) and loaded up the bikes. We started riding some time around 12:30. Everyone spent some time getting to know each other as we rolled up the trail. Bikepacking with kids in tow is best described as slow. Kids like to stop to look at flowers, push bikes up hills, push bikes down hills, have snacks, tell you how tired they are, have more snacks, complain about the lack of snacks, well, you get the idea. Suffice to say that we broke no speed records that day. We did get lots of time for the parents to speak among ourselves (mostly bike talk, this was a pretty bikey crowd). The stars of the show were the babies. My friends Andy and Ellen had their 8-month-old twin girls along. They towed them in their chariot with their gear distributed between the trailer and their panniers. This was the twins’ first overnight camping trip, so we were pretty excited to have helped indoctrinate encourage them to bring their kids out camping. The kids all had their usual lines about how tired they were, how far it was, and how steep the hills were, but their energy levels once we got to camp belied the difficulty of the riding. A 10-kid game involving bears, wolves, horses, and a lot of chasing took up most of the camp time, with the exception of all the eating of course. I have been on trips with parents before where there were structured activities for the kids. I am both too lazy to carry items like bored games, and all of the information that I have read shows free play to be valuable for learning and physical development. My kids often play with the toys in the backcountry: rocks and sticks, make crafts with the supplies in the backcountry: rocks and sticks, use the sports equipment in the backcountry: you guessed it, rocks and sticks. With such a bike crowd, it was no surprise that the kids’ bikes were all good quality light bikes. The parent’s bikes were a quirky assortment. Alex and I had our Krampus 29+ bikes, mine a singlespeed, which were overkill for this section of trail, but are versatile enough that both of us use them as our main bikepacking bikes. Ray earned some cred with his dump-salvaged Trek turn-of-the-millennium hardtail which was in excellent condition, especially considering its $0 cost. There was a fleet of long-tail cargo bikes present, mostly Xtracycles, a couple of MTBs, and Tania, Andy and Ellen brought their fatbikes. The three trailers were a fat-tired Burley, the Chariot child-carrier trailer, and Ray had a salvaged trailer that had seen better days but worked fine to carry their stuff. Arguably, the most suitable bike for this trip was Jeremy’s Surly Big Fat Dummy, a longtail fatbike destined to carry his children and gear across many sandy, snowy, or really any kind of adventure they choose. This summer has been extremely dry, and so the trail in was quite dusty. Much as we were enjoying hanging out together, we were all glad to have the rain start in earnest around 8:30 PM. Not only would the moisture consolidate the trail for the ride out, but it was a great way to encourage all the kids to bed. The rain on our tarp is a familiar sound to me and so I was quickly lulled to sleep. There is always a risk of a kid not sleeping on any trip, usually on the first night as they adjust to an unfamiliar setting. This was no exception and one of the twins (we won’t mention which) was reluctant to do any sleeping. The parents were heroically tolerant of this, I suspect they might even take her on another trip. The ride out is predominantly downhill. Thanks to the rain, the dusty trail had consolidated and was much easier to ride on going out than coming in. Even the least experienced riders had gained some extra confidence, though some of them were more tired than they had been on the trip in. I am very happy at how well this ride turned out. From meeting new people, to seeing different gear and styles, to enjoying the creativity and open minds of the children, it was a great success. We were talking of more trips even as this one was unfolding. There have been requests to join next year’s ride should we make it an annual event. I am overwhelmed by the positive response this has received. I am flattered that others think that the things I like to do are fun. Though this was not a major adventure, nor a life-changing experience, it was something that I hope the kids will remember. I feel it has strengthened bonds between the families and given us all new ideas. Thanks to all of you for joining us. Last year’s hike to the Rockwall was spectacular, but trail conditions were a little questionable, and the weather ranged well into the adverse zone with snow, sleet, hail, wind, and rain. We thought we would have another go at it this year to see if we could top our previous experience. There were many emails warning of bridges out and deadfall and avalanche debris on the trail. We weren’t overly concerned, since last year featured whole days of mostly climbing over deadfall, routefinding over large expanses of snow, avalanche debris, and the very same bridges missing. We were very concerned about the possibility of smoke obscuring the views, but we saw pictures and heard reports that it was clear, so we went ahead with our trip in spite of some trepidation. It is way less fun to do a world-famous hike when you can’t see the world-famous mountains – we experienced that at Mt. Assiniboine and had no desire for a repeat. We ended up having the luckiest hike in history. We lucked out on weather, though if we need to complain, a couple of days were too hot and sunny. We were also fortunate that the smoke was elsewhere, and the views were spectacular. The trail crew had been hard at work to clean the trail debris, the missing bridge was a trivial wade across the river, the sun had melted most of the snow, and there was less deadfall for the whole hike than we experienced some days of last year. One of our ideas for going in later July was that the wildflowers would be in bloom, and we certainly were treated to some impressive displays. On our third morning we were were alerted to the presence of a bear by some other campers. The bear had come between the two eating areas of the campground after circling the one where we weren’t. We made some substantial noise and the bear left. Our last 5 minutes of hiking were also enlivened with a bear sighting, this time an adult bear about 50m to the side of the trail. We again made some noise, this time with the safety latch of the bearspray off, and we made it to the car with the bear having been last seen heading slowly away from us. I awoke at 1:45 AM to a gnawing sound. I looked out the mosquito net to vaguely discern a shape that was possibly gnawing on Fiona’s flip flop. I bravely attempted to retrieve or bat the flipflop away from the (blurry) large-cat-sized rodent, possibly a large marmot? Fortune smiled upon me once again. The rodent was not a skunk. I am 100% certain of my mammal identification because my swipe at the sandal was interrupted by the pain of a couple of porcupine quills stabbing into the backs of my fingers. The porcupine wounds cleared up, and I hope I have learned an important lesson about finding the flashlight before lashing out at vague shapes in the night.